In today’s virtual world we all know the importance of a healthy IT system. This Information and Technology (IT) infrastructure is necessary for our homes, offices, and the communication between our loved ones to function properly. Wired and wireless, we count on this IT system every minute of every day. Within you, your Nervous System acts as your natural IT system to keep your body functioning properly by supplying your cells with Innervation. Innervation is defined as the “distribution of nerve fibers to an organ or body region.” Innervation is essential for the health of every cell, tissue and organ of your body. More than 45 miles of nerves connect your brain to your skin alone. Innervation between your brain and your heart, lungs, liver, kidneys, and muscles relay up to three million messages every second. This Essential Innervation monitors both your inner and outer world and adapts you to your environment. With the right training, IT can even help you execute the perfect golf swing or climb a mountain. Unfortunately, our tendency is to neglect our internal IT system until it breaks down. This is not a healthy choice! When it comes to your health, healing, or maximizing your health potential, there are some important things that you must know about IT. Life is not possible without this Essential Innervation. In his book Healing and the Mind, Bill Moyers found that immune system cells stop working when innervation is removed. We have all heard stories of people who have suffered brain or spinal cord injuries whose lives were cut short or whose bodies completely stopped functioning because they were paralyzed. Researchers are working tirelessly to find solutions to replace IT when it is lost. IT should not be taken for granted, ever. When Innervation is interfered with by vertebral subluxation only partial function is possible. Research out of the University of Colorado found that pressure on the nerve equivalent to the weight of a dime can reduce nerve transmission. Stretching a nerve by 6% can decrease the strength of its impulse by 70%. Interference to IT can cause immediate symptoms from colic in a baby to allergies, breathing difficulties, headaches or any type of pain. Because of the vast nature of the nervous system, the symptoms can mimic many diagnoses, even unexplainable ones. This is one reason why people with a myriad of symptoms get results with chiropractic care. Because the focus is on removing the Interference to IT rather than just making a localized pain or condition feel better, the body can begin to heal itself right away. Your body can function normally with proper Innervation. Every cell, tissue and organ can interact in a healthy way with accurate signals and messages being sent and received. Your ability to adapt to stress, digest food, eliminate waste, and perform daily tasks becomes second nature. With IT, you may even be able to walk and chew gum at the same time since IT works without you even thinking about IT. When you Optimize IT, you can achieve optimum health and peak performance levels and push your body to its limits. We see this in top performers and athletes, and every day people like you who run marathons or participate in Iron Man, Tough Mudder or other extreme activities. Lifestyle Care can help you Optimize IT, which is why most professional sports teams and athletes utilize chiropractic care. 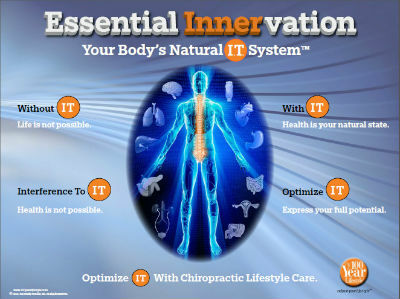 Now is the time to evaluate the health of your IT system with a chiropractic examination. Innervation is essential to life, healing, health and vitality. Make the health of your natural IT system your top priority.